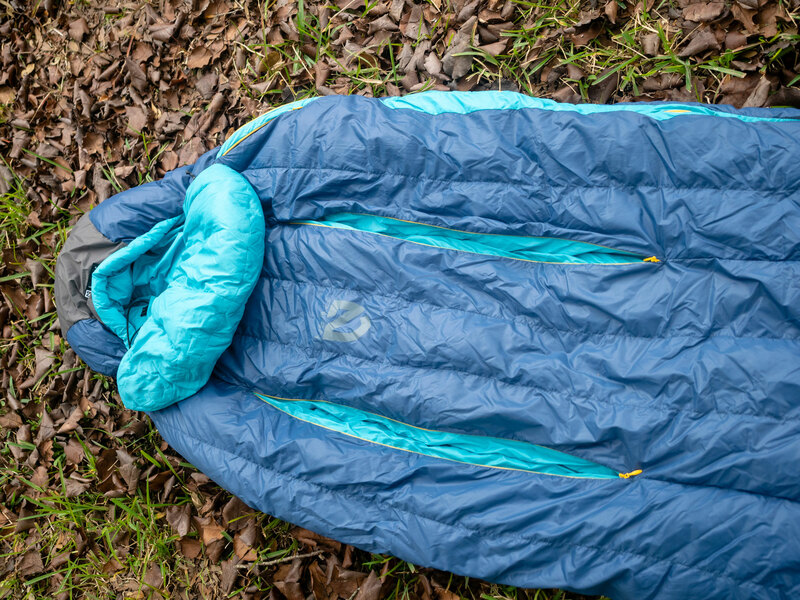 The NEMO Ramsey 30 is a middle-of-the-road sleeping bag with gills for dumping heat. NEMO released the Ramsey 30 Down Mummy Bag (the women’s version is the Cleo) for spring 2018, and we’ve been testing a sample since then. The bag has NEMO’s Thermo Gills. These allow heat to escape without letting in drafts. In short: The NEMO Ramsey 30 is a three-season bag that takes the middle ground on the performance vs. price continuum. Fill, material, patterning, and $250 MSRP make the bag attractive for those seeking a backpacking mummy bag that doesn’t sacrifice heavily in one area to dominate another. This bag sits right in the middle for thermal efficiency, weight, and price while possessing some unique features. The spec sheet of the Ramsey 30 details the middle-ground approach. Note down with midpriced but good (not great) fill power and a versatile temperature rating. The Thermo Gills are unique to NEMO. These 23-inch zipped slits in the seam lines between the Insotect Flow vertical baffles open to expose the interior liner fabric. This opening provides an uninsulated escape path for heat while keeping the inner liner as a barrier against drafts. Another unique feature is the Blanket Fold draft collar, an insulated “tongue” attached to the bottom of the bag’s hood. You can leave the Blanket Fold collar out for venting or flip it inward to seal the neck with a tucked-in feel. Finally, NEMO lines the exterior of the head and foot with its OSMO 40-denier nylon ripstop waterproof-breathable fabric to guard against tent condensation. 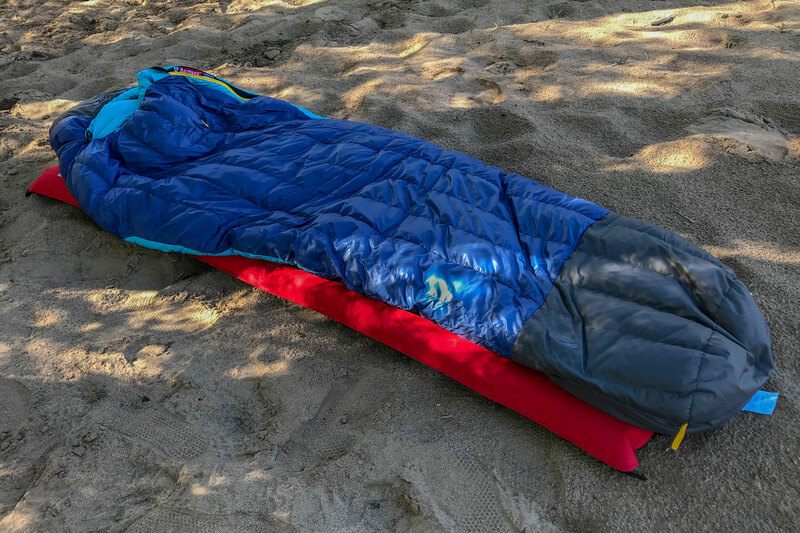 I tested the NEMO Ramsey in a wide variety of three-season conditions ranging from Texas winter backyard camping to a summertime kayaking trip in Colorado, with temperatures ranging from the low 30’s to the low 40’s. 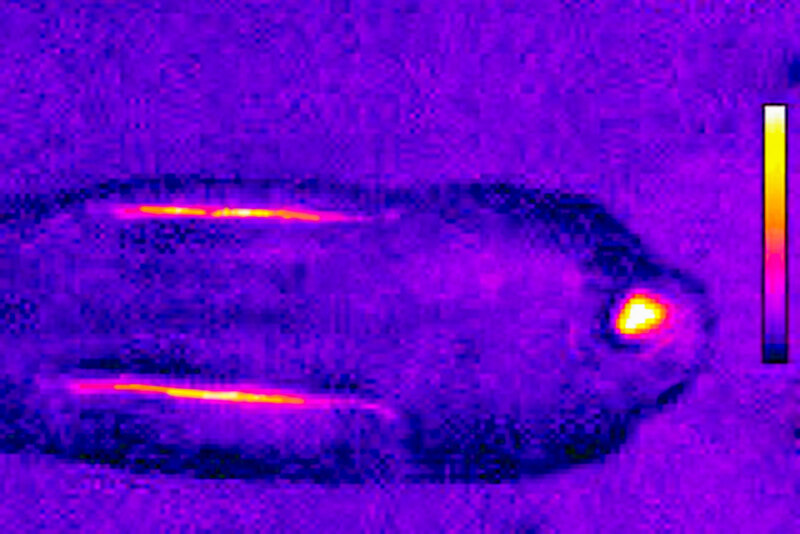 The big question: Did the Thermo Gills work? They did in a minor way. One night in Gunnison, Colorado, I slept comfortably at 40 degrees F with a steady breeze until sunrise. As the radiant heat increased, I opened up both Thermo Gills. I could feel the heat being sucked away, but only in the areas close to the vents. This venting strategy sufficed for a short time. But as the temperature climbed, I had to open the main zipper. When less heat loss sufficed, the Thermo Gills worked as designed. Flipping the Blanket Fold draft collar out of the hood also vented off heat without having to adjust anything else. As a side sleeper, the proposed improved comfort wasn’t as dramatic as it could be to a back sleeper. I most appreciated the waterproof-breathable foot and hood panels. At 6 feet tall, I often touch tent walls at both ends and have found my feet cold due to wet insulation many times. The OSMO fabric kept the underlying down completely dry, especially at the foot of the bag. And I wished the hood had just a bit more lateral coverage. Only the center top portion has OSMO protection, and in crowded two-person tents, the side of my hood often touches a tent wall. In a backyard open bivy with lows just below freezing, I still felt warm with long base layers, a wool hat, and a down parka inside. The bag does have a generous cut, with a 61-inch shoulder girth, 57-inch hip girth, and 53-inch knee girth. So it’s a good choice for restless sleepers or those with larger builds. But this gives up some thermal efficiency for thinner occupants. Putting the down jacket in the bag with me made a substantial difference in how quickly the bag warmed upon entry. Drizzle covered the Ramsey 30 in the morning, but the DWR coating kept the down from losing loft. The NEMO Ramsey 30 hits a sweet spot: The specs lie in the middle of their potential ranges. It’s not an ultralight bag, with the highest-fill-power down and a super-efficient cut. But it’s relatively light, comfortable, warm to at least its rated temperature, and sports unique features — all for a reasonable price. The Ramsey and Cleo are also available in long and 15-degree versions.